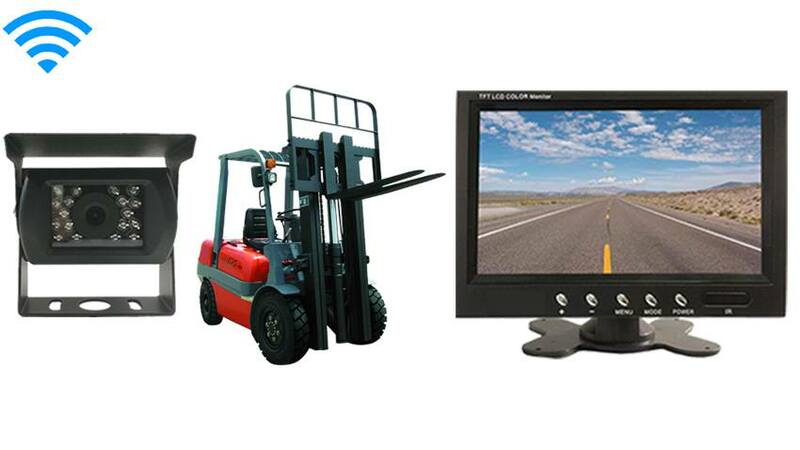 This Forklift Rear View system Has a 120° Degree viewable angle, its waterproof and has auto night vision. The camera is one of the most durable we have, with incredible adjustability and night vision clarity. The RV Box camera has a metal sun shield visor to protect you from glare and pebbles. This is by far our toughest built camera. It has been regularly used in cars, vans, buses and even industrial sized caterpillar trucks, operated in the harsh oil sand of Canada. This rearview camera can take a direct hit from a rock and it will still work like new. This back up camera is also wireless (so there is no cable between the camera and monitor) and it runs on batteries (so no 12V is needed). Just call us if you need those options modified and we can do that for you. Place this Forklift backup camera system anywhere on your Truck or Forklift and you wiil be able to see everything using the 7 inch monitor. Keep in mind we can make the monitor bigger or smaller depending on your needs.